Halloween has a complicated reputation. Sure, some of us love it, some of us like it — and if you’re like me — you mostly tolerate it. Though Halloween has never been my personal favorite holiday, I do think it is kind of misunderstood. 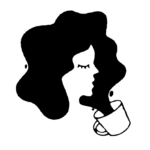 Every October, we collectively hold our breaths as the day arrives — the fear of racist/sexist costumes and the stress of generally chaotic Halloween partying all run rampant towards the end of the month. But I have a different Halloween experience to present. In recent years, I have started to re-appreciate Halloween because of its really strong friendship vibes. We already have a lot of “friendship” holidays — many of us spend Thanksgiving with friends instead of family, spawning the now well-known term “Friendsgiving.” Because of Leslie Knope, Valentine’s Day has become more about Galentine’s Day — and other holidays like St. Patrick’s Day generally consist of big celebrations with your friend group. Halloween is a weird one. It’s a great holiday for families (especially when you’re a little kid and/or if you have little kids in your family) and it’s a great holiday for couples (duo costumes are adorable) — but really, it’s a great holiday for friendships. I am not only referencing my personal life, though my best friend and I did dress up like Ann and Leslie from Parks and Rec last year and KILLED IT. But I have also noticed a really strong theme in the television shows I love. Halloween brings people together. Since I’ve already made multiple Parks and Rec references, you know I’ve got to throw in one more example from the show. In the season four episode, “Meet ‘n’ Greet,” friendship runs amok in Pawnee. 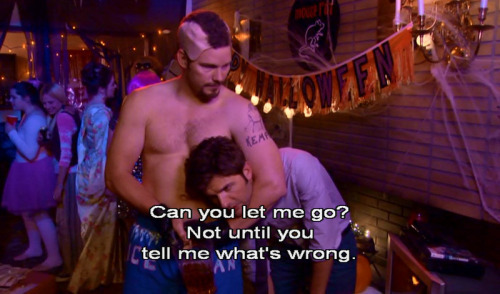 The episode revolves around a Halloween party that Andy and April throw against the wishes of their roommate, Ben. Ben is going through some thangs in “Meet ‘n’ Greet,” largely due to his sadness over no longer being with Leslie. He mopes around and refuses to join in on the Halloween fun — but this episode is arguably the episode in which he and Andy first acknowledge their importance to one another. Andy forces Ben to talk about his feelings by holding him in a headlock, eventually getting his nose broken when Ben’s reflexes kick in. Though Andy’s nose is broken, they go to the hospital together and kind of solidify their friendship. Andy even corrected the nurse, telling her that Ben is his brother. More friendships develop in this episode as well — Ann and Ron fix all of the broken units in the house, Tom and Leslie encourage each other to chase their dreams, and April even almost defends Jerry when she steals Chris’s keys after he grinds on Jerry’s daughter at the party all night long. 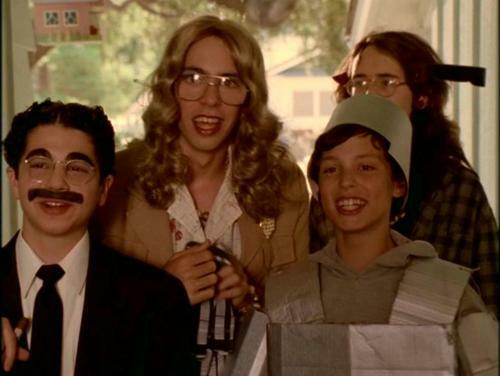 In Freaks and Geeks' only Halloween episode, "Tricks and Treats" (since there was sadly only one season), both Lindsay and Sam learn huge friendship lessons. Evading her mother’s desire to spend Halloween together handing out candy to the neighborhood kids, Lindsay joins up with the other “freaks” to flirt with Nick and pick on younger teens. While Lindsay is struggling to impress her new friends and leave childhood traditions behind, Sam struggles with the fact that he might be a bit too old to trick-or-treat. While Lindsay tries to impress her new friends, she eggs somebody who ends up being Sam, her own baby bro. The realizations had by the characters are clear but impactful, which is the case for most Freaks and Geeks eps. You have to grow up sometime (Sam) and real friends would never pressure you into doing what you don’t want to do (Lindsay, both in ditching her mom and bullying her brother). 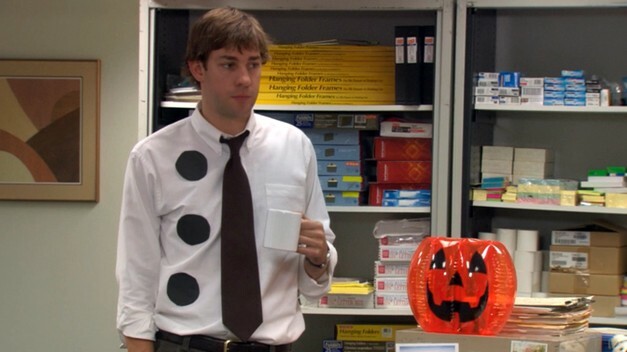 It is during a Halloween episode of The Office when Jim and Pam share one of their best pre-dating, pre-marriage moments. After Pam attempts to mend things with Jim, we get one of those beautiful Jim moments where he looks at the camera –assuring us that Pam is the only reason he is still with the company anyway. Though we know that Jim and Pam’s “friendship” is based on something else (TRUE TRUE LOVE), the acknowledgment of their significance to one another, even pre-relationship, is truly something special. Halloween is great. Like most holidays, it comes with its baggage, but we should remind ourselves that Halloween is a prime time to let people into our lives and solidify the friendships around us.